Bite-sized Mexican churros! These little guys make a spectacular party favor or dessert option! veggie oil (deep fryer or large pot with oil). Boil water with cinnamon stick. Add 1 tbsp. sugar, and 1 tsp. salt. Stir in 3 tbsp. butter or margarine. Add one cup of flour and stir, stir, stir until the dough comes together. Set dough aside in a glass bowl allowing the temperature to lower. 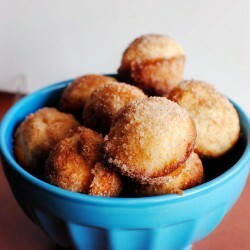 To make the cinnamon dust, mix 1 cup sugar and 2 tsp. cinnamon. Going back to the churro dough, crack the eggs over the top of the dough. Fold in the egg until dough is smooth. Scrape the sticky dough into a large ziplock bag. Twist all of the air out of the baggy. Cut the tip off of one corner of the bag’s bottom. Squeeze the bag and snip off one inch pieces into the oil. You should do batches of 6 or so at a time. Flip the churro bites over once they turn golden in color. Allow them to cook through and remove and set on a stack of paper towels. Roll them through the sugar mixture and serve!